Burnsville, MN. The Force continued their winning ways with a 56-0 victory over the Minnesota Vixen. 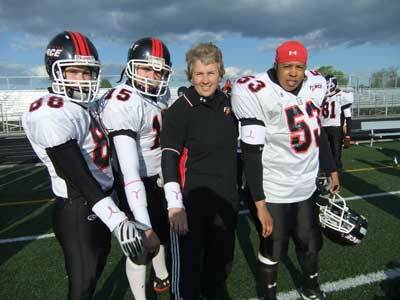 The last time Chicago started out 5-0 they went to the IWFL National Championship Game in 2008. In support of the Kay Yow/WBCA Cancer Fund, in collaboration with Nike, players and coaches from both teams wore pink wristbands. Despite being the second weekend in May, the mid 40 degree temperature along with a stiff northerly cross wind made it feel more like an October evening. The Force was hot and wasted little time. Rookie receiver Jeanette Gray got things rolling on the opening kickoff when she took off from the Force 25 yard line, and returned it to the Vixen 45. Steady quarterback Sami Grisafe then rewarded Gray when she found her for a 15 yard reception. Two plays later Grisafe threw a pretty 23 yard pass to receiver Patricia Harper who never lost her stride into the end zone. Carolyn Lee converted the pat and the Force was never challenged racking up an impressive 409 offensive yards. On their second series, Lee took a handoff, the “O’ line blew open a huge hole, and Lee scampered 49 yards. She barely got to catch her breath quickly setting up for the pat. At the seven minute mark of the first quarter rookie Dana “speedy’ Vermilye recorded her first career touchdown running around the right sideline from the 10. Long runs of 26 and 20 respectively by Brandy Hatcher and Jennifer Benson allowed ‘Cat” Converse to score relatively easy from the 7. Rookie receiver Taylor Malloy set up the next Force score taking a Grisafe handoff 25 yards to mid field. Next Gray had an impressive 50 yard scoring run breaking three tackles and getting some help from Harper who made a key block. “Jeanette had a breakout game and is starting to become the player that we thought that she would be,” said receivers coach Bill Smith. Benson tallied the next 2 scores showing great speed bursting up the middle on a 72 yard run, and 22 yards down the left side. “Jennifer has a lot of speed and when she finds the hole most times it’s tough to catch her,” said Head Coach John Konecki. The coaching staff rewarded the non-starters who work hard in practice with ample playing time in this contest as every member contributed to this win. The defense pitched yet another shutout and has given up just 12 points all season ranking them near the top of the 51 team league. Standouts included; nose tackle Amber Burns, linebacker ‘Blue’ Hall, Laura Parkes, and guard Tracy Johnson who delivered a crunching hit late in the game to preserve the shutout. Zenia Varas, Kim Maxwell, Trudi Vaksdal, Casandra Cattouse, Kelly Biel, Veronica De Jesus, Linda Torres, Chris Johnson, Dorian Bridges, Natalie Malasanos, Katie Romano, Kristen Mertens, Candace Griffin, Samantha Scurto, Melissa Whyms, and Veronica Soper all deserve mention. The Force is on the road again next weekend, traveling to Madison to take on the Wisconsin Wolves.